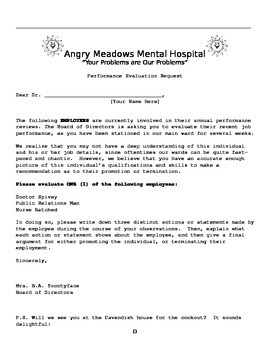 This is a set of characterization worksheets for One Flew Over the Cuckoo's Nest. 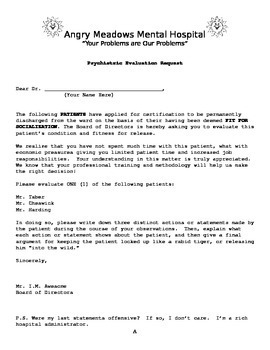 Provides three different worksheets, each one asking students to make an evaluative decision on the fitness/unfitness of a staff member or patient in the hospital, providing evidence to support their assessments. Students must find three pieces of evidence for their chosen character. For patients, students evaluate whether or not they are ready to be released. For staff members, students evaluate them for promotions or firings. 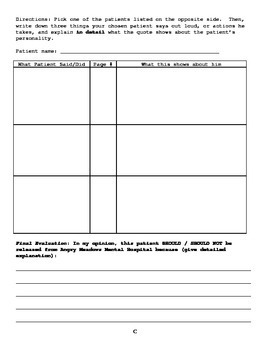 Six-page document creates three 2-sided handouts, with satirical hospital instruction "memo," and graphic organizer for providing textual evidence and final assessment of character.